Thank you all for being here today, great turnout. Thank you also to Gorry, Wordsworth Books, Cape Times and Dornier Wines. Libby and myself have a mission for our publishing business. Quivertree aims to produce books that celebrate South African culture, we attempt to discover a unique South African aesthetic, emerging from our diverse background. 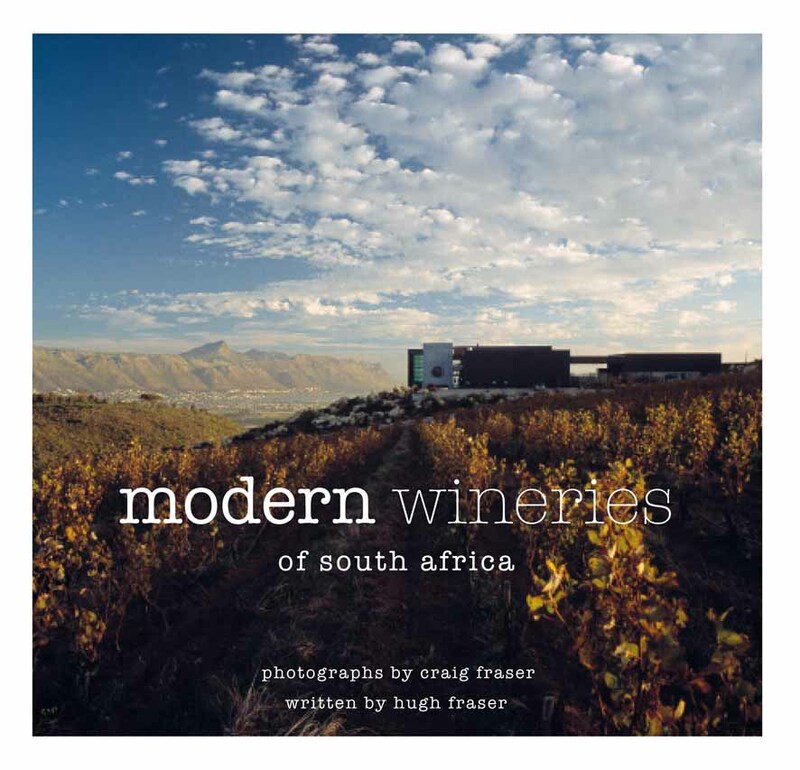 Our ever growing collection of books discovering design in such diverse places as the mud huts of the old Transkei to the high tech world of the modern wineries. Books such as ‘Mud Chic’, ‘Africanismo’, ‘Hot Afro’ and ‘The New Safari’……… buy them they make a wonderful collection. If we as SA’s want to establish and cement an identity we need to respect our own achievements and celebrate our own culture. Libby Doyle, co-owner of Quivertree, is the graphic designer of our books, she turns the ordinary into the extraordinary she is the magician, who puts our books together Libby does the production as well as the marketing. wine industry BUT it has gone largely unrecognised by the international book publishing world, especially for our architectural excellence. The choosing process was guided primarily by innovation, we wanted to include wineries that break the traditional mould, so it was easy to exclude the vast majority of wineries designed in the Cape Dutch style. The selection process was not complex at all, we were looking for new ideas, people taking a risk, new interpretations of winery architecture. The buildings were not chosen for their ‘genius’, what do I know about how successful a project is? They were selected for their unique approach. The book aims to excite the reader on an emotional level more than an academic one. Architects, interior designers and developers will definitely be inspired by the book but that is a tiny market and we wanted to make it accesible to a wider audience. To counterbalance my emotive, visual approach we brought in the expertise of Hugh Fraser an architect and writer. We also asked the ‘president of the SA institute of Architects Al Stratford to write the foreword in which he describes the book as an, “essay on – science and technology, art and culture”. The book takes the reader into the wonderful sensory world of wine. We can experiece a taste of the lifestyle, we can be part of the dream. The owners of these estates, the architects and winemakers have created worlds which are a wonderful escape. It is a fascinating visual account of the variety and wonders of our wineries in South Africa. If one considers the above criteria there was not a huge choice in the end, these wineries are the innovators, they are the beginning of a new era. Wine farms are evolving to accomodate new technologies as well as new demands from the public. They are no longer restricted to merely offer a tasting room and tour of the cellar, they have become destinations in themselves, many have restaurants, art galleries and accomodation. I have always been interested in design but I had better things to do with my time than to study for seven years to become an architect, my father an architect himself, discouraged me, probably because he didn’t want to pay for another seven years of school for another of his children, my oldest brother is an architect too, I had to settle for the next best thing and spend my life taking photographs of architecture. To be honest my real fascination is with communicating through visuals and playing with light as much as with subject matter. Photography affords one huge opportunity to explore the world and make a living while doing it. I have a degree in journalism from Rhodes University, I am not sure that qualified me to do anything but have a good time. In my final year I specialised in photojournalism, this coupled with having had 14 years experience in commercial photography has given me a unique set of skills. Early in my career my mentor Roger Bell a highly regarded photographer at the time taught me a vital lesson, one will ony be respected if you specialise. In 1994 I went out as a freelance photographer with a portfolio of 12 photographs marketing myself as a specialist interiors and architectural photographer, 16 years later I am still learning and loving the challenge of photography. We did feel it was important to give a sense of place so I photographed all the wineries in their setting to illustrate the dialogue with the landscape. To me the landscape includes all the elements, the earth, the light and sky, I try to bring these elements in, for me a successful photograph will record a moment in time, I try to fascinate the eye, to surprise the viewer, to draw them in. The single most important element that sets a compelling photograph apart from a snapshot is the light, I am most conscious of the play of light on the subject, all other factors are secondary. My approach could be described as an emotive one rather than intellectual, I get most excited when standing there in the vastness a shaft of light breaks through the cloud and transforms the scene into the extraordinary. I suppose I am very influenced by my photojournalism training, responding to what happens in front of me rather than trying to manipulate the elements by bringing in artificial lights and props. I like to find the magic in what is there, I do not try to manipulate it. I still use film for my photography, it is what I know, it is simple, I am mobile and able to change location easily and quickly. My camera is a manual one so I use only shutter speed and aperture with a hand held light meter, i love the idea of capturing a moment. I try to use minimum equipment, travelling light, surveying the subject, pacing around it finding the most pleasing aspect and getting the photograph. I do not do a hundred options, it is a considered approach. Architecture and landscape are very different technical challenges, a building for instance does not move in the wind, a landscape has no straight lines, a building presents flat vertical flat surfaces that can be challenging, a landscape has very few reflections like a vast flat surface of a glass window. When photographing the interior of a building there are all sorts of challenges with the colour balance from south facing windows where the light is very blue or the interior tungsten light. Composition in a landscape can be challenging, often it lacks a focal point. With experience and a keen eye one can use all these various factors to ones advantage, both disciplines are challenging and both equally gratifying when one gets it right. This journey was an exciting one, I think the concept is unusual and every project I take on brings with it new insights, in a years time I imagine i will approach it slightly differently, that is the beauty of photography one is never 100% satisfied and always has the feeling that it can be improved on. At this point I would like to introduce you to the multi talented writer, architect and public speaker, Hugh Fraser. I would like to ask Hugh a few questions otherwise he will be up here all afternoon. As an architect give us a sense of the challenges one would face when taking on winery design? Taking into account what you have just said, Hugh, without hurting anyones feelings, which of the wineries in the book do you feel is particularly successful? What were the challenges of writing about these buildings? Hugh with this move away from our very recognisable Cape Dutch heritage do you think that we are losing a bit of local flavour? Anything important you feel needs to be said? Any questions from the audience? I would like to thank all the wineries who willinlgy participated. Special mention must also be made of the editor Sally Rutherford who did an incredible job. Hugh has a short film to show us, a whistle stop tour of his journey while doing the book.